Testing out friction with duck races! 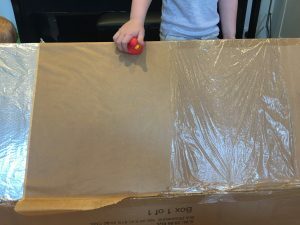 We took delivery of a large item that came in a large box. 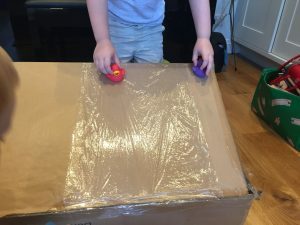 If your kids are anything like mine, then the box is at least as exciting as what it contains, and is never thrown away until it is falling apart! I decided we would use this box to test out different materials for their friction coefficient. 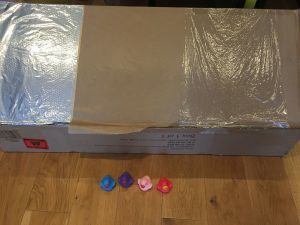 I put a sheet of tin foil, some baking paper and some cling film on the top of the box – and left a slither of the original cardboard showing. I then tilted the lid so that it was resting of an angle. The boys and I collected 4 ducks with smooth bottoms from their bath toys and started experimenting. 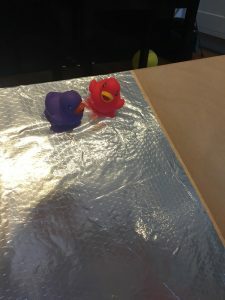 I tried to ensure that the ducks were ‘let go’ and not pushed, and that they started from the same height to make the test as fair as possible. My 4yo made some predictions about what would happen. We found the foil was perhaps surprisingly ‘sticky’ and the ducks hardly slid at all. 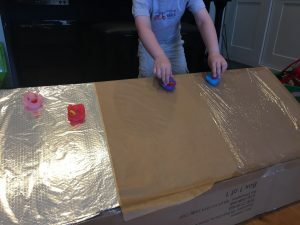 The baking paper was the winner and the cardboard was pretty good too. My toddler thought this was great fun (although he did slightly throw the ducks, so I didn’t count his results in our data!). My 4yo then decided to test out our ramp by increasing the gradient to see what would happen. This gave us a chance to talk about gravity and how things moved faster down steeper ramps. 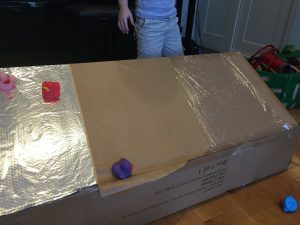 Of course, you can’t play with a cardboard box in a structured way for too too long without the boys wanting to get in it…but we had good fun with our duck races before this happened, and they learnt a bit about different materials in the meantime.